These easy potato recipes are delicious. Many varieties and preparation methods that include fried, baked, boiled, mashed and broiled - I've got them all. You will love my homemade hash browns and easy potato side dish recipes below. Do you eat potatoes that are green? DO NOT EAT THEM..
Green potatoes and potato sprouts are high in the alkaloid solanine, which can be toxic if eaten in large quantities. Remember this when making a potato recipe - Green potatoes should not be eaten and sprouts on any potatoes should be removed before cooking. Alkaloids are harmful nitrogen compounds. Potatoes, tomatoes, eggplant, and bell peppers contain relatively large amounts of these neurotoxins. Light turns potatoes green; and when they are stored in the light, the percentage of the toxin increases a hundredfold. These quantities cause nausea, diarrhea with vomiting, and headaches. In the worst cases, unconsciousness and convulsions to the point of respiratory paralysis. Potatoes should always be stored in the dark, and any green spots should be removed before cooking or eating. Very green potatoes should be thrown away since cooking does not destroy the toxin. 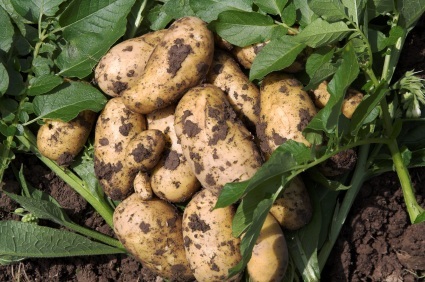 Small quantities of solanine pass into the cooking water even from blemish-free potatoes; therefore, it is best to discard the cooking water rather than trying to reuse it. Now the good news. Potatoes provide an energizing supply of carbohydrates, as well as important vitamins and minerals, including potassium, niacin, vitamins B6 and C, and manganese. Eat them with the skins to boost fiber intake. Now on to my easy potato recipes. Purple Viking: has a smooth and creamy texture; excellent for mashing. Red Bliss and Red Dakota: have a dry, flaky and sweet texture and are excellent for potato salad or roasting. Russet or Idaho: are starchy and have a dry texture. They are used for baking or mashing. Russian Banana: are excellent for roasting because they have a tender and buttery texture. White Rose: Waxy and thin-skinned; make potato salad with this variety. Yellow Fingerling: Very moist and flavorful and excellent for roasting. Yellow Fin: Buttery and creamy. Use this for boiling and baking. Yukon Gold: Tender, buttery and very versatile. Use when roasting, baking or mashing. For those of you just learning to cook, I have included a beautiful and easy potato recipe; the good old fashioned kind. 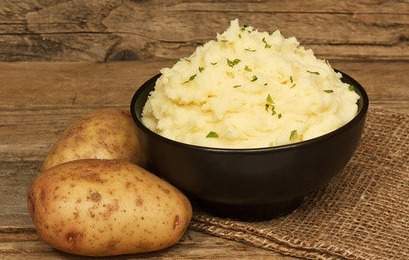 Traditional mashed potatoes. Yum. Cover potato cubes with water in a medium saucepan. Cover and bring to a boil until very tender; approximately 20-25 minutes. Drain well and place back in the saucepan to evaporate any remaining water. Add warm milk, butter, salt and pepper; mash until light and fluffy. NOTE: When you are busy during the holidays and don't want to mess with peeling potatoes, just follow this step. Peel and cube the potatoes a day (or two) ahead of time, put them in your pot covered with water and add some lemon juice - about 1 TBSP per 5 lbs of potatoes. Cover and refrigerate until you're ready to cook them - no need to drain them. The lemon juice will keep the potatoes white and fresh and won't alter the taste. Mix the ingredients together and sprinkle with the chopped green onion; serve immediately. 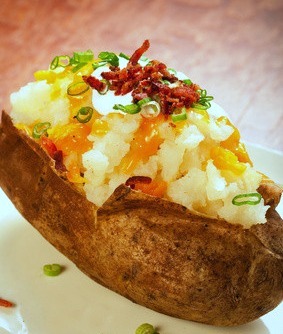 You can also add more shredded cheddar, and bacon on top of the hot potatoes in a bowl; out-of-this-world-good. If you like, you may also prepare this in a casserole dish. 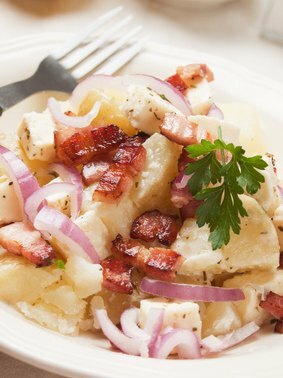 Combine the potatoes, sour cream, bacon, salt, pepper and half of the cheese and spoon into a buttered 2 quart baking dish. Sprinkle with the remaining cheese and green onion. Bake, uncovered, at 350 degrees for 20-25 minutes or until cheese is melted. This recipe is so versatile...you can saute mushrooms with the onions, add chilies, whatever you like in your mashed potatoes. This easy potato recipe is an delightful side dish that is easy to make and so good. Bring a large pot of salted water to a boil. Add potatoes and cook until tender but still firm, about 30 minutes. Drain, cool and slice thin. Place bacon in a large, deep skillet. Cook over medium high heat until evenly brown. Drain, crumble and set aside, reserving the bacon drippings. Saute onions in bacon drippings until they are golden-brown. In a small bowl, whisk together the flour, sugar, salt, celery seed, and pepper. Add to the sauteed onions and cook and stir until bubbly, then remove from heat. Now add the chicken broth and vinegar, then return to the stove and bring to a boil, stirring constantly. Boil and stir for one minute. Carefully stir bacon and add 3/4 of the sliced potatoes into the vinegar/water mixture, stirring gently until potatoes are heated through. If it is too saucy for you, add more potatoes. 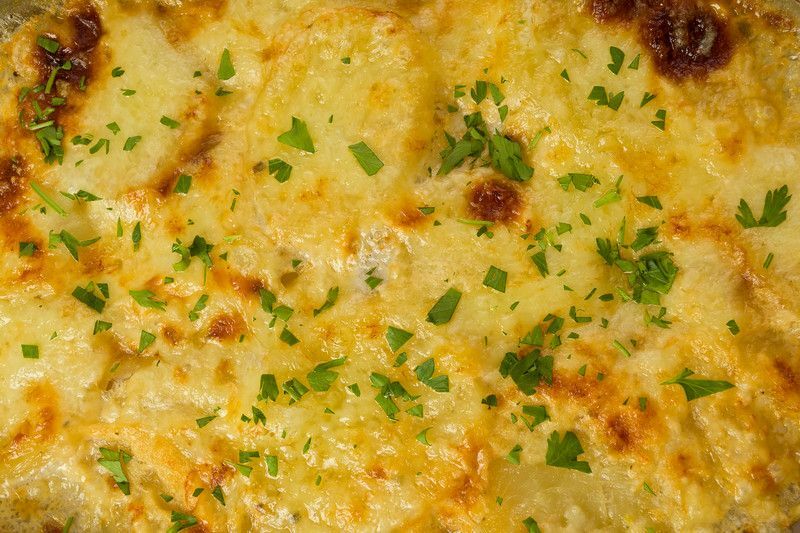 Now you can serve this hearty and easy potato recipe and expect to get rave reviews. 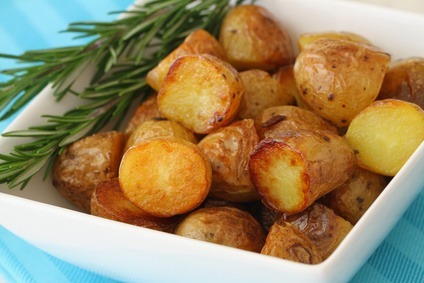 Place potatoes in a pan, cover with water and boil for 15 minutes or until fork tender. Drain and place in a large bowl. Drizzle with olive oil and lightly toss. In a small skillet, add the butter and saute the garlic for one minute. Add the parsley and mix well. Add the boiled potatoes and lightly toss together. Cook for a minute or two and season with salt and freshly ground black pepper. Serve. I love this easy potato recipe with burgers, fried fish or chicken. Great when dunked in homemade ranch dressing. Spray a large baking sheet with oil and add sliced wedges. Drizzle with olive oil and toss to coat completely. Sprinkle with garlic powder, onion powder and lightly with seasoned salt. Roast until crispy on outside and tender in the inside; approximately 25 to 30 minutes. You may use Cajun seasoning and parmesan cheese for a spicier version and serve with homemade aioli (garlic mayo). You may use russets, red or even sweet potatoes for this easy potato recipe. PREHEAT oven to 450 degrees and you need to grease a roasting pan or baking sheet. 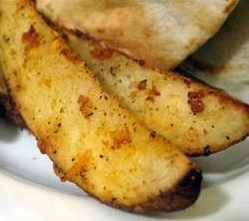 Cut each potato lengthwise into eight wedges. In a large bowl, combine the oil, shallots, garlic, salt, paprika, cayenne, garlic powder, onion powder and pepper; add potatoes and toss to coat. Bake, uncovered, for 30 minutes or until tender and golden brown, turning every 15 minutes. Sprinkle with parsley, and dip in Ranch dressing. NOTE: Before you grill your chicken or meat, turn the grill to about 400 degrees and place on the top rack if you have a sturdy cookie sheet. Grill about 20 minutes, flip them and finish off another 20 minutes until golden-brown. Can't get any better than this easy potato recipe. Rub the potatoes with canola oil, prick with a fork and bake for 1 hour. After they have cooled to touch, slice them horizontally and scoop out the cooked potato within 1/4" of the edge. Mash with the evaporated milk, sour cream, butter and season with salt and pepper and return back to the shell. Sprinkle each with Parmesan, cheddar cheese and bacon. Return back to the oven on a cookie sheet for 15 minutes, or until the cheese has melted. Serve with grilled steak and a tossed salad. My easy potato recipes are at the end, but you will find more fresh vegetable recipes below. Enjoy. PREHEAT oven to 350 degrees and you will need greased casserole dish. In a small saucepan, melt the butter and then whisk in the flour. Let it cook for a minute and then add the milk; season with salt and cayenne pepper. While whisking, bring the mixture to a slow boil; add the sharp cheddar cheese and whisk until melted. Place half of the sliced potatoes in the prepared casserole dish and sprinkle with 1/2 of the onions. Now pour half of the cheese sauce over them. Repeat and finally sprinkle the top with the cheddar cheese and paprika. Bake for 1 hour and serve with ham. This easy potato recipe is so simple but a comfort food to me. I love these. Cut potatoes in half and saute them in butter in a heavy, nonstick, large saute pan, Dutch oven or electric skillet, until golden and beginning to crisp on the outside, about 25 minutes. Add the rosemary and scallions to the pan and stir well. Saute contents gently for another 10-15 minutes or until potatoes are tender. Serve warm with creme fraiche. PREHEAT oven to 350 degrees and spray 9x13 pan. Break up the frozen hashbrowns in the bag. In a large bowl combine the onion (or bacon, bell pepper), 1 cup cheese, cream of chicken soup and can of milk. Combine. Mix the hashbrown in and stir to coat. Pour into the prepared pan and top with the remaining cheese. Place foil on top and bake for 40 to 50 minutes. Take the foil off the last 10 minutes and brown the cheese. Top with chopped scallions. 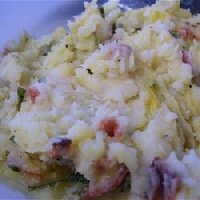 I have more than easy potato recipes, please check out more below.